I don’t know where to begin. I could say you had me at pulled pork and hush puppies but I think that might be getting ahead of myself just a little bit. Maybe if I just start at the beginning I might be able to do some justice to what I am about to talk to you about. My wife and I had been invited by one of my sisters to meet up in Virginia and spend the weekend at a swanky resort (Dare I say time share). And I know what you’re thinking, I had many of the same thoughts. But the thing is we hadn’t been out of the state of Michigan in a number of years now. We seriously needed to escape the snow and cold even if for just a weekend. Little did I know the pain I would find on the back roads of Virginia. Needless to say (is it really needless? I mean I find a need to tell everyone who will listen…) The scenic backroads of Virginia know nothing of straight lines. By the time we finally made it to Gordonsville we had already stopped several times to ask locals for directions. For a while there no one had even heard of the town of Gordonsville. We were beginning to think the place didn’t exist. Sure it had been some time since we have travelled but I am no stranger to riding the highways. I had maps and my iPad for navigation as needed. Wouldn’t you know that the entire time on the freeway and then through the backroads we never once, not once saw a place to stop and siphon off some wifi. I was beginning to think we slipped back in time to the 1950s or something more vile. Low and behold we found the dead center of Gordonsville, and I do mean dead center. It’s a round about and that’s really about it. Sure some gas stations but we were manic by that point. 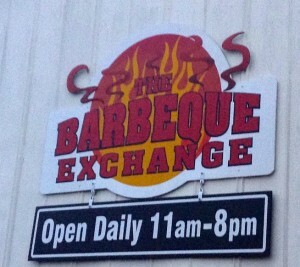 What we did find was The BBQ Exchange just past the town center. Oh how the course of my weekend changed. Let me tell you, this is the highlight of my trip. My wife went inside to see if we could maybe get some directions. She was gone for a couple minutes and it’s been a long ride. I had to make a pit stop so I went in. Had my tablet, of course, not like the thing leaves my side. Found her talking to a couple gentlemen in red aprons when I came in. The dining room is filled with picnic tables with a tear away paper table cloth. They have a caddy with six different sauces (didn’t see it at first but when you sit down to eat you can’t forget the sauces). It was getting close to closing time and the place still had a decent number of guests loading up. Heck, there was a line just to order still. They must have seen us coming, lost, confused, bitter hatred for all things highway related. 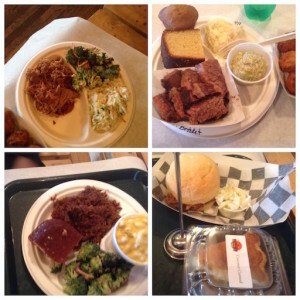 They set us up with a pulled pork sandwich, coleslaw on top, some hushpuppies, and lemonade. Let me tell you, the road disappeared. If this had been the one thing I traveled 13 hours in the car for, it would have been worth it. They got us hooked into the wifi so I could update my iPad map and gave us directions to where we were going and got us back on the road again. Our spirits lifted just enough to make the last few miles bearable. (It really was one of those kinds of road trips, though we spent most of it laughing with highway madness). After all that we made it to the cabin at the resort and did all the obligatory family stuff and then talked about lunch the next day. Ya, we were going back. Here’s the thing, it’s cool one time to treat weary travelers like they are important. You do what you can for other people and all that. If that was all it was, they would have gotten their sale the next day, which for the group came out to a decent enough return on investment. But it went further than that. I noticed our new friends from the night before and waved. They made it a point to come out and talk to us. Busy restaurant at lunch and they are taking a few moments to make sure we are doing good and answering questions. 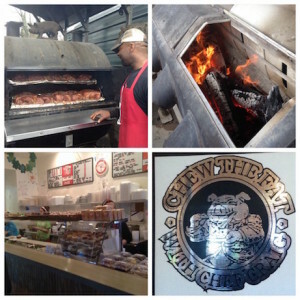 Add in to that we are told we have to make a trip out back to say hi to the pit master and check out what he has on the smoker. In case you were wondering, 700 pounds of pork, brisket, and ribs. He does that every day. So maybe you’re wondering what exactly we had for lunch that day. I can’t speak for everyone else at the table but my wife and I had the brisket. We could have had it pulled but they also slice it fresh for you too. We did the sliced (oh ya). Now I am always willing to try cabbage and slaw in various forms. They have a pepper cabbage (a sweet and sour slaw) that was fantastic. My wife got the spicy slaw (turned out it was a little too hot for her so I got two slaws that day). Throw in some corn bread or their pumpkin muffins and you have a meal. But I don’t stop there. I also had to have a round of hush puppies because, well you gotta right? Now you would think that would be enough. But we can’t have an adventure like this without hitting into something exotic and strange. They have a couple things on the menu I had no idea about. The questions come all around for this. Fu Q, the name alone is enough to bring any group like ours into fits of immature giggles. Turns out it is smoked tofu, perfect for the oddball vegetarians in the world. Mind you, it’s pretty damn good. They also had hog wings. 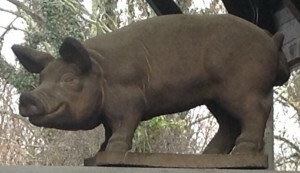 What the heck are hog wings? You have the same look right now that I had when I first read it, I can see it, don’t lie. Anyway, what they are, is a portion of the pork shank, a little bigger than a chicken wing. They batter them in hush puppy batter and deep fry those bad boys. Let me tell you, I could have gone through a whole bottle of their fire hog fire sauce with these alone. Now you have to bear with me cause I feel like I have been talking for ages and we still have a bit to go before this is done. We were set to leave Virginia on Sunday. My wife and I stopped in one last time for some shirts. Simple right, pick up shirts then high tail it back to the highway (dreaded Virginia highways) on our way home. I ended up running into Craig Hartman, the owner before we made it out the door. We spent a few minutes thanking them for all their hospitality and great food over the weekend, you know the usual pleasantries. You would think that would be the end of the story, but it never really goes that way does it. He ended up giving us the best directions out of the state and to the turnpike we had all weekend. I mean seriously, this shaved at least two hours off our previous time. On top of that they wouldn’t let us leave without taking some lamb stew and Irish soda bread (I mean it was close to St. Paddy’s day after all). We had a good trip home. If you ever make it down that way, make a point to visit. You will be glad you did. 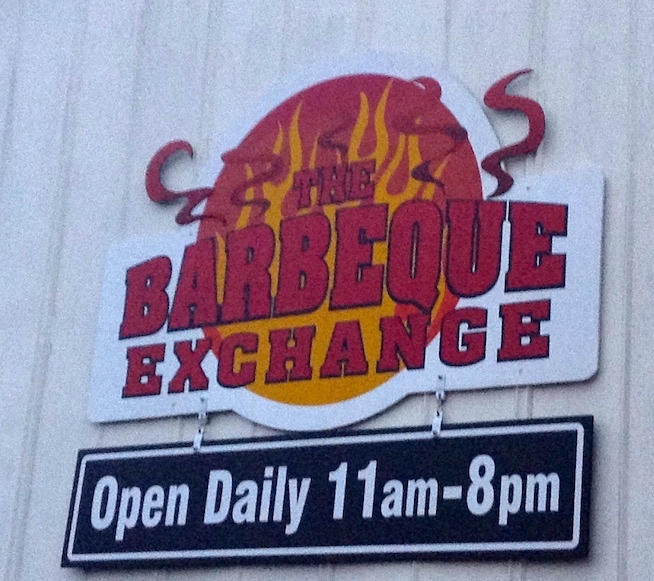 4 Responses to "BBQ Exchange Gordonsville Virginia"
What a wonderful trip. Isn’t it worth all of the aggravation just to find a place like that. This was a great find. I do regret we didn’t have time to find a brew pub while we were there too.